What would you say if you win 250 toys and games from Hasbro Toys? Guess what, the Cartoon Network Hasbro Holiday Sweepstakes is back! 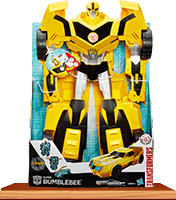 Here’s your chance to win the most wanted toys and games of the holidays as Hasbro and The Cartoon Network are giving away 1,000 of them including the Transformers Robots In Disguise Super Bumblebee figure, the cute Starlily My Magical Unicorn or the incredibly fun Pie Face game! Want to win? Grab a parent and go online for a chance to win at cartoonnetwork.com/win! One lucky kid will win the Grand Prize of 250 Hasbro toys and games! So you want to know how to win this year’s Hasbro Holiday Haul? You made it to the right place! Starting today, with the permission of your parent, check out the Cartoon Network Hasbro Holiday Sweepstakes and register by entering your email address. Go on and enter by December 24, 2015! The Cartoon Network Holiday Sweepstakes is open to legal residents of the forty-eight (48) contiguous United States and the District of Columbia, who are at least six (6) years of age and no older than eighteen (18) years of age on the date of entry. And remember, you can enter as many times as you want but, only one entry per day! Love cartoon Network, and already have a playhouse to store the toy and games…I would really love to win. I need to win this prize so I can give the toys to the needy. I WOULD LIKE TO WIN IT FOR MY COUSIN AND FRIEND IT WOULD GIVE US MORE THING TO DO. i really want to win so i can buy toys for less fortunate kids. my daughter LOVES!!!!!! cartoon network its her favorite channel in the WORLD!!!!!!!!! I really want to win because I dont have enough money to buy or presents for my family this year. I really want to win you are the best Cartoon network . You’re my favorite network . You’re awesome . Can I please win.Please. Please let me win please if I win then I will say thank you. If I win I am going to donate to the poor. please let me win my daughter will donate the toy’s she dose not want to the children who don’t have any toys to play with. My name is Aiden I’m 7 years old ,And my sister Leila is 9 and I all so have to little Brother by my Dad to share with. my Mom help less fortunate kids in Haiti that will be very good to share with them because all kids love cartoons but does kids doesn’t have anything ,If I have the chance win that will be the best Christmas that I can hope for. I would donate to the hospital. I hope I win. Cartoon network is the best TV show ever! I LOVE YOU CARTOON NETWORK ALOT!!!!!!!!!!! hello my name is Alyssa M. yeary. I am 11 years old. ever since I moved to Colorado I have watched cartoon network. I watch cartoon network at least one time a day. In my school I have a special room. the special room is for kids with disabilities. Every day people laugh at them when they have outbursts. I would LOVE to donate some toys to the special room. I have two friends who are less fortunate than me. One friends name is Maryjane D. clark; She have very little toys, food, and money.It would an honor to donate some toys to her. My other friend is Aleigha yeager.Aleigha does not have a lot of money either. It would be awesome to give away some toys to her. As you all know there are kids with cancer. the parents of those kids do all that they can for there child. Sometimes sadly some kids pass away. I have a girl who goes to my school who had cancer. I also have a boy who had cancer. Those kids were lucky they fought through cancer. I would love to give away some of the toys to cancer care units.